Above is a video of them fighting. Sadly, there isn’t any good rumble strutting, but—lucky you—there is plenty of ball-dragging, and attempts at spraying each other. Gross. However, every once in a while their bickering escalates past the dominance displays and into potentially dangerous territory. On the 4th, my neighborhood had evidently decided en masse to all buy all the fireworks and stage a several-hour-long assault on my house from all sides. Considering I, a human who understands what is going on, was super freaked out, I assume the pigs thought the world was coming to an end. They are also not known for their emotional maturity or productive coping mechanisms. As a result, there was a full-on, flying ball of fur fight. I pulled them apart, and one was crying and twitching weirdly. I scooped him up, convinced the other pig had severed a vital nerve and debating whether I was sober enough to run to the emergency vet. Luckily, he stopped twitching; unluckily, I found a pencil eraser-sized chunk had been bit out of his rump. I examined the other pig and saw a bloody bite on his nose. It was late. I couldn’t just put them back together again for fear one would end the other. Also, I needed to keep an eye on the wounds. Fortunately, I have piggie disinfectant wash from the other half a dozen times I have dealt with bites—which has been too many—so I was able to wash them, and make a temporary cage for the little one. It is now the 10th and I was finally able to get them back into their cage together. 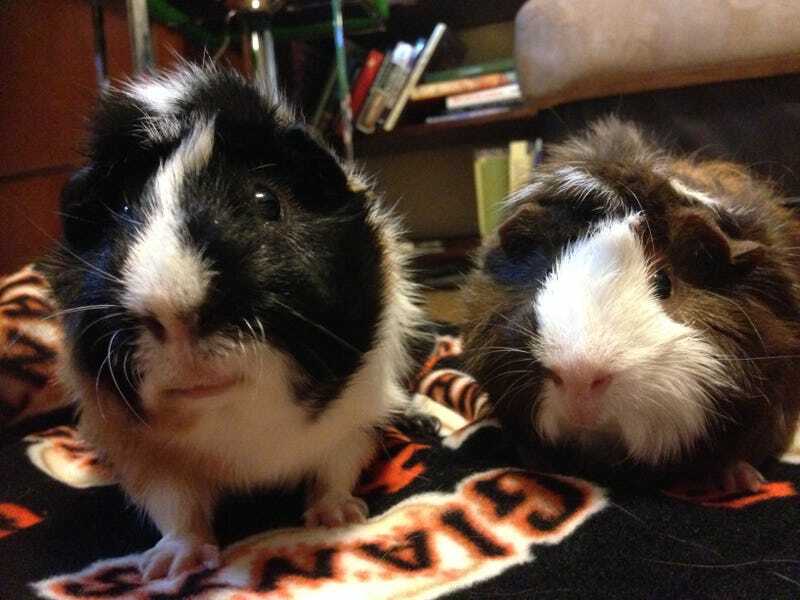 There is a process that one must go through to introduce (or reintroduce) guinea pigs. Sometimes it involves baths. It always involves a weird staging in a “neutral” space (i.e. another room). I spent the better part of my day overseeing this operation. Luckily I am just writing papers, so it wasn’t that big of a deal for me to hang out at home all day. Nevertheless, what a pain. They are back together, and I have already witnessed no fewer than a dozen spats—two that almost broke out into fights. I just hope they don’t kill each other. Who would have thought such cute things could be so violent?